Striking hammer to the anvil, as a symbolic gesture to seal the marriage, has become synonymous with Gretna Green. All the wedding venues, both in Gretna Green and nearby Gretna have the anvil as part of a wedding ceremony, as it is traditional. The home to the oldest anvil in existence is the Famous Blacksmiths Shop in Gretna Green, where the tradition began following the first runaway weddings in 1754. Through the passage of history, other locations and venues have played their part in the colourful history of run-away marriages. Gretna Green and Coldstream in the East were communities located just over the English border and became popular destinations for the desperately in love. 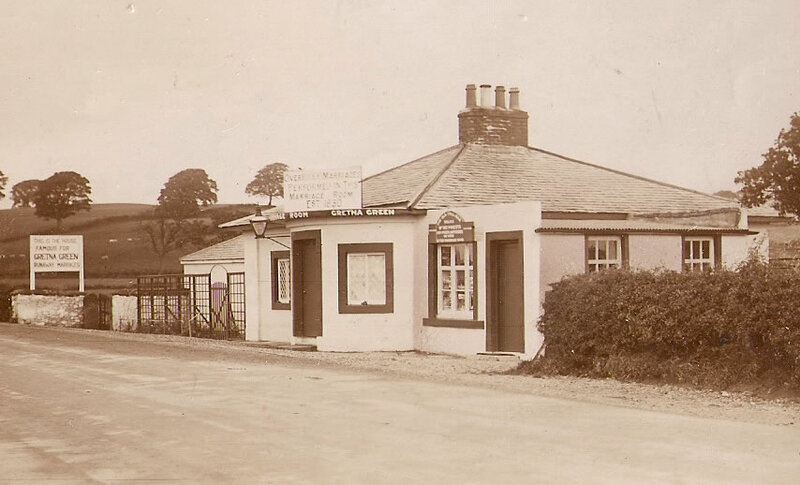 Gretna Green was located on a more commonly used coaching route between London and Edinburgh, therefore, it became a more frequently used spot. The characters that conducted the ceremonies here also assisted in the rise of Gretna Green's popularity in conjunction with the many widely reported scandals involving rich heiresses and men of ill repute! Today it is the Famous Blacksmiths Shop that is best known and associated with Gretna Green weddings and romantically the anvil became the enduring symbol of Gretna Green Weddings. This can be credited to the many 'Blacksmith Priests' of flamboyant character who conducted ceremonies within the Famous Blacksmiths Shop. Another notable marriage house was the Gretna Hall. During its days as a Coaching Inn, the Gretna Hall became a wedding venue for 'men and women of breeding and social prominence'. John Linton leased the Inn early in 1825 and he made the Inn a safe and dignified sanctuary for aristocratic runaway couples. As a modern-day venue, weddings take place in the external outbuildings which once housed the horse and carriages used to travel to Gretna Green. The Coachhouse is the most famous of the 3 and boasts a stunning 18th-century carriage which was the State Coach of the Marquess of Linlithgow. All the rooms are full of character and in keeping with tradition, each room features an anvil, which to this day seals your marriage in Gretna Green. In 1830 a by-pass road saw trade dwindle at Gretna Green. The traffic was diverted from the village and over the Sark Bridge. At this point, the Toll Bar known as Allison's Bank Toll became the first house in Scotland. The tollkeeper, Mr Murray intercepted couples travelling across the Sark Bridge and for a small fee performed the ceremony himself. He became a very rich man and with his fortune built the Gretna Chase Hotel. 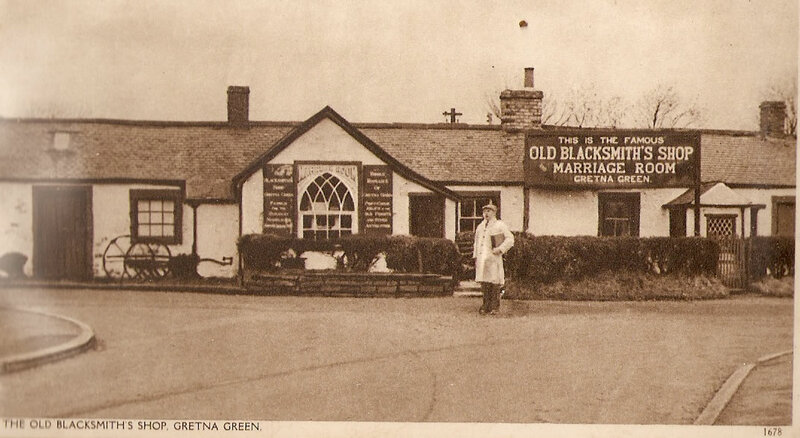 Marriages did take place within other establishments in and around Gretna Green. The ceremony was so simple and required no planning; the crucial factor was to ensure that you had reached Scottish soil. The urgency and pressure the couples were under to marry before the opposing relatives caught up with them provided an opportunity for certain locations to prosper by formalising the ceremony and ensuring someone was always readily available day and night to conduct the required ceremony post haste.